OKLAHOMA CITY -- On Sunday, the Trail Blazers lost their first game of the season in which they lead going into the fourth quarter. On Monday, they tried to win their first game this season after trailing going into the fourth. After trailing by 20 points at the half, the Trail Blazers held the Thunder to 22 percent shooting to cut the lead to single digits going into the fourth quarter. But Thunder forward Paul George wouldn't allow the comeback to come to fruition, scoring 18 of his 47 points in the fourth to lead the Thunder to a 120-111 victory in front of a sellout crowd of 18,203 at Chesapeake Energy Arena. "The first half was frustrating, Oklahoma City really played well," said Trail Blazers head coach Terry Stotts. "They were shooting the three, we struggled to make shots... I liked the way we competed in the second half." The Trail Blazers are now 33-23 overall and 10-15 on the road this season. After sweeping the Northwest Division rival last season, Portland is now 0-3 versus Oklahoma City this season with one game to play in the series at the Moda Center on March 7. After a demoralizing loss to the Mavericks in Dallas on Sunday afternoon, the Trail Blazers had the difficult task of trying to bounce back versus a Thunder team that had won 10 of their last 11 and five straight at home. And after the Thunder went on a 13-4 run to take a 39-29 lead into the second quarter, it looked the hangover from Sunday's loss might carry over. "We knew it was going to be a tough game," said Stotts. "They're playing their best basketball of the season so far for them." The second quarter gave even less cause for optimism. 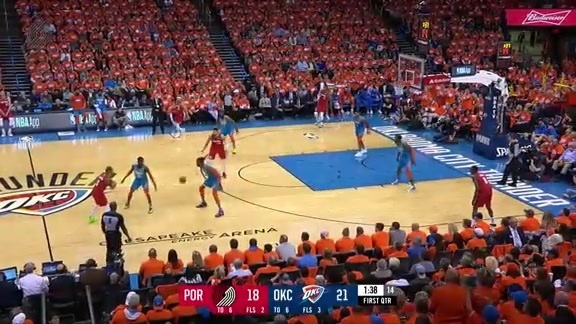 Portland shot 23 precent, Thunder guard Raymond Felton, playing in his first game in over a month, went 6-of-7 from the field and 3-of-3 from three for 15 points in the quarter and Jusuf Nurkic picked up three fouls in less than five minutes. Between all those factors and entering the second quarter down 10, the result was a 68-49 halftime deficit. But rather than fold up playing in the second game of a back-to-back, the Trail Blazers rallied in the third quarter behind the offense of Damian Lillard and the defense of Al-Farouq Aminu. The former put up 13 points on 5-of-7 shooting in the third while the latter limited George to four points on 1-of-5 shooting. Between the play of Lillard and Aminu and seven point in under six minutes from Jake Layman, Portland outscored Oklahoma City 33-19 in the quarter and finished the third on a 10-0 run to cut Oklahoma City's lead to 87-82 going into the fourth. But that's as close as Portland would get. George would get his offense back on track and no Blazer other than Lillard was able to do the same. 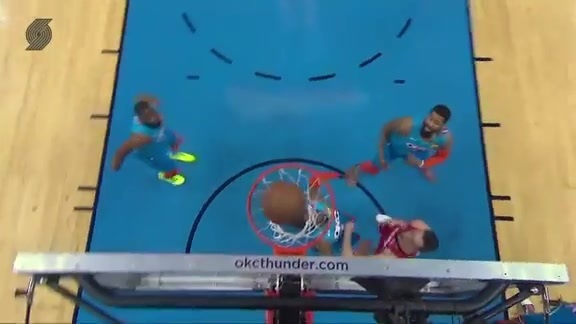 Oklahoma City's lead fluctuated between high single and low double digits throughout the fourth before coming away with the nine-point victory. The Trail Blazers were led by Lillard, who went 9-of-22 from the field, 3-of-8 from three and 10-of-11 from the line for 31 points to go with seven rebounds and four assists in 37 minutes. Layman came off the bench to go 5-of-7 from the field and 2-of-3 from three for 17 points and four rebounds in 28 minutes. Nurkic came a point short of a double-double with nine points and 12 rebounds before fouling out in 30 minutes. Aminu and CJ McCollum each finished with 13 points, with Aminu also tallying nine rebounds. George led all scorers with 47 points to go with 12 rebounds and 10 assists for the triple-double. “Exceptional. (George) is playing at a very high level," said Stotts. "To me he is playing the best basketball of his career. He is catch and shoot, taking it to the basket. He is very difficult to guard one-on-one." Russell Westbrook went just 5-of-19 from the field and 1-of-6 from three but still finished with his tenth consecutive triple-double with 21 points, 14 rebounds and 11 assists in 37 minutes. G-League callup Deonte Burton went 7-of-9 from the field and 3-of-5 from three for 18 points and former Trail Blazer Raymond Felton added 15 points. After finishing a two-game trip 0-2, the Trail Blazers now return home to host the Western Conference-leading Golden State Warriors in their final game before the All-Star break. Tipoff is scheduled for 7:30 p.m.